New-school Mark Trail: not only does he consort with geese but he also expresses the human emotion of affection for his wife? Bizarre. I mean, at least he’s doing it from a distance of several miles, so he won’t be expected to hug or kiss or touch or look at her. Seems relatively safe. Also, notice how he pairs up “being married to you” and “living here in Lost Forest”: if I have my LoFo lore right, the Trails’ cabin home is actually owned by Cherry’s father Doc. So, yes, this actually makes sense: every once in a while, Mark needs to placate Cherry’s intense, terrifying, incomprehensible feelings with an absolute minimum physical contact, so that he can continue to live rent-free in a cabin next to a forest, which is all he’s ever wanted in life. “I’ll be home later, honey!” he says. SPOILER ALERT: He’ll be home a lot later. 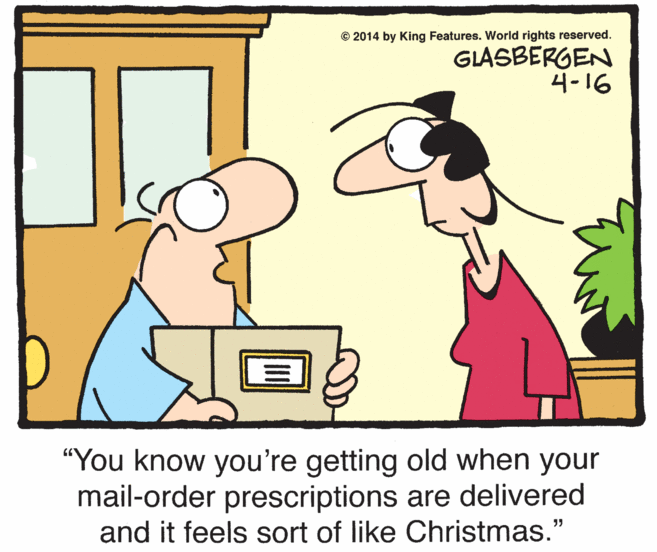 You know you’re a desperate pill addict when your mail-order prescriptions are delivered it feels exactly like your birthday and Christmas and every other holiday plus the day you got out of prison when you went away for mail fraud that one time combined.